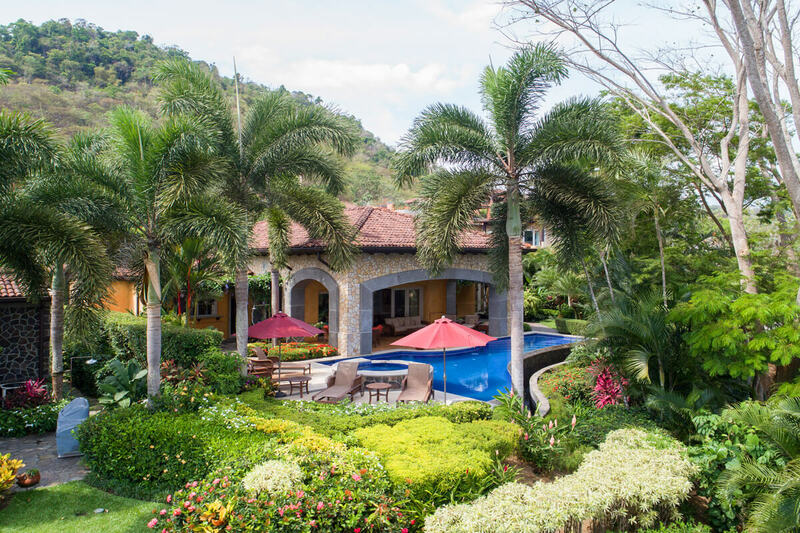 If you’re traveling to Costa Rica with your friends or extended family, you’ll love La Perla. There’s three suites in the main house and a king suite in the guest house. Every room is regal and elegant, especially the open-concept living/dining space and kitchen. The outdoor area is totally relaxing too, and you have tons of privacy since the villa is in a gated community. La Perla offers luxurious living space and manicured landscaping in a lush, tropical environment. Located in Altamira, an exclusive neighborhood above the marina, La Perla combines breathtaking ocean views with a central location in a gated community. La Perla’s Spanish colonial style incorporates tile roofs, mosaic accents, and warm interiors. The pool curves around the spacious terrace and Jacuzzi. Loungers and umbrellas face the sea, and the gardens provide privacy on the other side of the pool. The veranda’s circular, mosaic table, plush reading chairs, and cushioned sofa enjoy ocean views and are the perfect place to relax in the shade. There’s also a BBQ grill around the corner for al fresco feasts. The living room’s oversized sectional faces the flatscreen TV and entertainment system, and a wet bar sits to the right. An antique chandelier hangs over the polished dining table behind the couch, and the gourmet kitchen is on the other side of a regal archway. Its breakfast bar doubles as a prep counter, and the Wolf range appliances are hidden behind discreet wood paneling. It has two ovens, two gas stoves, two sinks, and a coffeemaker. There’s a powder room in the elegant entryway and a full laundry room down the hall. Air-conditioning runs throughout the villa, and every room has an individual unit. The master suite has a four-poster king bed, garden access, a walk-in closet, and a massive ensuite bathroom. The master bath has a dual vanity, a W.C., a walk-in shower, an outdoor rain head shower, and a Jacuzzi tub. The second king suite is across from the laundry room and has an ensuite bathroom with a rain head shower. The third suite has two full beds, a walk-in closet, and an ensuite bathroom with a rain head shower. All three bedrooms have a plasma screen TV and exterior access. The guest house is in the garden courtyard, and has a king bed, a study, an entertainment system, a kitchenette, a walk-in closet, and an ensuite bathroom. La Perla is located minutes from supermarkets, the marina, restaurants, and golf. It’s ideal location and four spacious suites are ideal for a couples getaway or a family vacation. Short ride to the resort Beach Club at Playa Herradura.